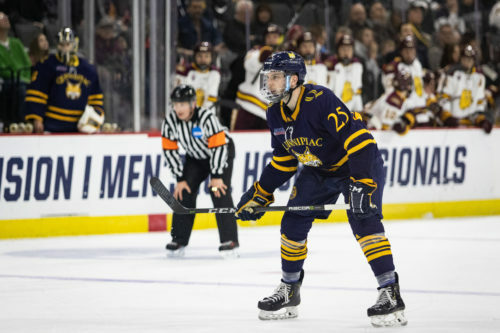 With the Quinnipiac men’s ice hockey season now over, a number of Bobcats are making the jump to the professional level. Junior defenseman Brogan Rafferty, senior defenseman Brandon Fortunato, senior forwards Craig Martin and Scott Davidson and junior goaltender Andrew Shortridge have all signed contracts. 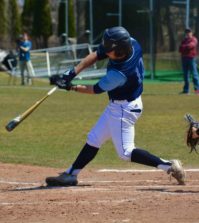 Martin, Davidson and Fortunato concluded their final season at Quinnipiac this past weekend, while Rafferty and Shortridge are electing to leave early. Rafferty was the first Bobcat to sign a contract this offseason. The undrafted free agent agreed to a one-year, entry-level contract with the Vancouver Canucks on Monday, April 1. 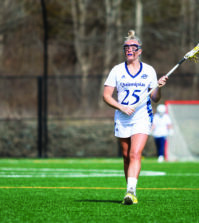 “I’m eternally grateful for my time at Quinnipiac and everything my teammates and the staff has done for me in my three years,” Rafferty said. Rafferty leaves Quinnipiac after three years on the Bobcats’ blue line, concluding his junior year with 24 points and a total of 60 points in 108 career games. Three days later, on Thursday, April 4, Rafferty donned the blue and green of Vancouver for the first time, as he made his NHL debut in Nashville, Tennessee. Rafferty would play a total of two games with the Canucks before their season ended on April 6, finishing with three shots on net. On Tuesday, April 2, Martin signed an amateur tryout contract (ATO) with the Springfield Thunderbirds, the AHL affiliate of the Florida Panthers. Martin was third on the team in points this season with a career-high 30 points and finished his Quinnipiac career with 75 total. Shortridge elected to forgo his senior season and signed an entry-level contract with the San Jose Sharks on Tuesday as well. The Anchorage, Alaska native was one of the best goaltenders in the nation, finishing first in save percentage and second in goals against average. Shortridge was also able to get his first sniff of professional hockey, as he reported to San Jose’s AHL affiliate, the San Jose Barracuda. He played in the final regular season game for the Barracuda, a 3-2 loss to the Colorado Eagles, where Shortridge made 33 saves on 36 shots. With Shortridge leaving, it opens the door for sophomore goaltender Keith Petruzzelli. The Detroit Red Wings draft pick was starting early in the season for Quinnipiac, but lost the job to Shortridge by winter break. Petruzzelli only appeared in three games since the new year and had not started in a game since Jan. 4. Fortunato inked a two-year, entry-level contract on Friday, April 5 with the Nashville Predators. The defenseman is still recovering from a season-ending leg injury that occurred in early February. Fortunato transferred from Boston University after his sophomore season and leaves Quinnipiac with 36 points as a Bobcat. On Wednesday, April 10, Davidson signed a deal with the Charlotte Checkers, the AHL affiliate of the Carolina Hurricanes. His deal is an ATO, joining Martin as the second Bobcats to get an ATO with an AHL team. Davidson recorded a career 41 points in 153 career games with Quinnipiac in four years. Senior defenseman and now former captain Chase Priskie, along with senior defenseman Luke Shiplo, are the only seniors to remain unsigned. However, in Priskie’s case, it certainly is not because of lack of interest. Priskie announced he would not be signing with the Washington Capitals and instead, testing free agency. The Capitals drafted Priskie in 2016, but Priskie is choosing to become a free agent on Aug. 15 and will see what other offers he has. All of these players leave a legacy at Quinnipiac. The group of Priskie, Shiplo, Davidson and Martin helped the Bobcats win their first ECAC Hockey championship in 2015. 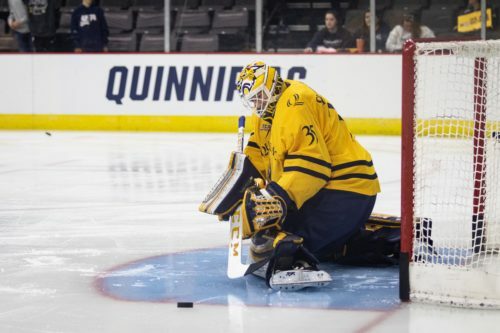 The entirety of the group aided in righting the ship, as Quinnipiac had one of the best bounce-back seasons, going from a sub-.500 record last season to having a share of the ECAC Hockey regular season title and being just one win away from a Frozen Four appearance. While these players will no longer be wearing the Bobcat blue and gold, the fact that they are making the jump to the next level of hockey showcases the program that has been built here in Hamden.